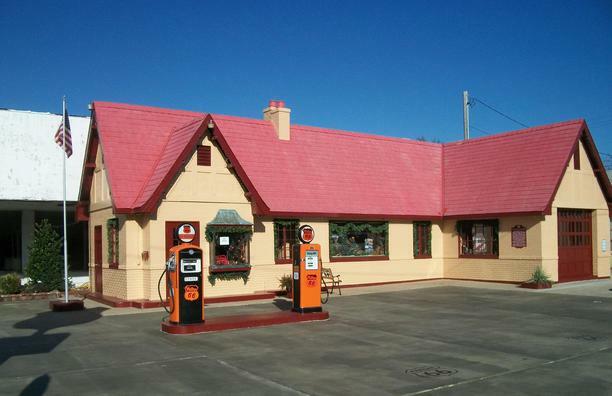 Constructed in 1930, the Kansas Route 66 Visitors' Center started its existence as a gasoline station owned by the Independent Oil and Gas Company. The station replaced an earlier livery barn at the corner of 10th Street and Military Avenue in Baxter Springs. The new station opened July 7, 1930 as "one of the districts finest". The Tudor cottage style received much attention from the community and in local advertisements. The station didn't operate long under the Independent Banner, but was merged into the Phillips Petroleum Company with the rest of the company on September 2, 1930. By October, the station joined three other businesses in Baxter Springs selling Phillips 66 products. Within a year following the merger, the property was officially transferred into the ownership of the Phillips Petroleum Company. Both Phillips Petroleum and Independent Oil and Gas chose similar Tudor cottage styles for the design of their service stations, rebranding involved little more than replacing signs and matching paint schemes. Sometime before August 1942, an addition was built on the east side of the original service station structure. The "L" shaped addition contained a one bay service garage connected to the original building by a area used to display automotive merchandise offered for sale. Phillips owned the property until1958, when it was purchased by J.R. Parsons. The Parsons family owned and operated the station as Parsons Oil until selling it to Phillip R. Coulter and his wife in December 1966. Coulter sold the property to Cherokee Oil Company the following March, and Cherokee Oil sold it to Reeves Oil Company on April, 1969. After operating as an auto service station for forty years, the building was converted to an office in the 1970's. In 2003, the structure was placed on the National Register of Historic Places. In 2005, the Baxter Springs Historical Society purchased the property and under a grant with the National Park Service and support from the community and concerned individuals, restored the building to its 1940's appearance in 2007. Our Visitor's Center is open seasonally March - November, and is staffed by Volunteers. Please contact the Museum for additional information.